We all know how useful screen technology is for our children – they can access information for homework, keep in touch with friends who move away and say 'hi' to grandparents and other family members in other places in the world. But alongside the benefits are the worries we have about the AMOUNT of time that seems to be spent on screens. What are the physical problems? This is a chemical that your body produces and makes your heart beat faster, raises blood pressure and makes you feel good – the ooh! feeling. This gets released when you treat yourself to chocolate, fall in love or win something. You get a “squirt” of dopamine when you get a text message, email or snapchat etcChildren can get slightly addicted to this, when their developing brains are given the buzz over and over again. 2. “Wake-up” brain waves vs “Calm down” brainwaves. The brain produces Alpha (calm-down) waves when we relax and zone out a little. That’s what happens watching television, and explains why many adults use TV to chill out at the end of the day. Beta waves (wake-up) are produced when we are alert – talking, listening, working something out. When children are asked to switch off the TV after long periods of watching they can find it difficult to regulate their concentration (the beta waves) properly. 4. Obesity – there are clear links between the amount of TV and screen use and children’s weight problems. What are the emotional problems? Children who are glued to their iPads, laptops or TVs are not talking to you, and that’s a major problem. All parents have experienced that glazed look, or the “uh-huh” response when trying to communicate something to their 9 year old deep into Minecraft. 2. Pre-teens and teenagers don’t get to practiceREAL conversation and REALinteraction when it’s so much easier online. Again research shows and any wired teenager will tell you it’s GREAT to be able to pretend to be dazzling when you aren’t feeling so good about yourself. The problem is when that dazzling personality also includes snaps of your exciting body..and photos sent to an intimate friend get passed around. Or even when the virtual world becomes a safer place than the real one. Switch off screens I HOUR before bedtime – reduce that stimulating glow, let busy minds settle down to sleep. Monitor what younger users are doing by keeping laptops and PCs in shared family areas. Say up to 14 yrs old. Have a central charging station overnight – OUT of the bedrooms. Once a week, month have a screen fast where everyone has a day off phones, TVs and iPads. Give kids clear amounts of time they can be online – and use kitchen timers to keep to it. And most importantly let’s work to keep talking alive..
Moving house and home is a big upheaval for adults. Let alone the kids, but there are a few things which can make it super difficult for the younger members of the family. Children thrive on two things which seem to be opposites: One is novelty. (So this makes them excited and pleased about change - like us.) They grow and learn because we constantly introduce them to new things, new tastes, new people right from babyhood. It is necessary for them to get used to unfamiliar things. But then the other element which helps them to grow and consolidate all this is stability (sameness if you like) . With this they are able to feel secure emotionally, and this forms a base for them to develop cognitively. In short – it is safe to try new things. But this is a mobile world, and families often have to move. So there is some careful balancing to be done if children are to flourish as the adults change communities. Yes and no. Children are hardwired to adapt – right from birth, but if there is not much consistency, or messages from adults downplaying the effect of a move , children will not only suffer but also simply NOT be able to adapt as easily as we would like. We also have to think about different personalities. Some kids can do a lot of change, some just can’t. It does also depend on how many changes children have been through. Despite your child being “used to moving” – there may be one that is the straw that breaks the camel’s back…. I have seen children who have moved several times since toddlerhood, all with “no trouble at all” and then at move number 4 or 5 at around the preteen age just give up and show symptoms of stress. Firstly – it’s an issue of TIME – we adults can process things faster (or at leastwe think we can!) Children need longer to adjust, to acclimatise. Remember – you might have been processing this move for a very long time, planning the career change, looking up real estate etc and they will probably be the last to know! Secondly, children don’t necessarily access the REASONING that adults do – why this is so good, why there will be fun ahead to make up for the losses. They just can’t imagine why this kind of bedroom or that bigger garden will be better than what is familiar to them. ARE THERE SIGNS THAT CHILDREN AREN’T SETTLING IN?? With younger ones, toddlers to 4 or 5 years old you see that they are struggling to make sense of new surroundings, and they may well show any upset in everyday functions, like not sleeping so well, or wetting the bed. Or refusing to eat food they think is “different” from at home. Teenagers tend to be more vocal in their expression of likes and dislikes. They can feel that a move away from friends has completely ruined their lives..and let you know all about it. Conversely, they also have more mature thinking available to be able to comprehend the necessity of a house move, for job or financial reasons. With adolescents it’s wise to read beneath the surface, and listen out for their feelings (nostalgic? Relieved? ) so that you can show some sympathy. WHAT CAN WE DO TO MAKE SETTLING IN EASIER? The first thing when you get to the new home, is to take a moment to think about, visualise even – the old placeAsk: What have we left behind? Just mentally walk through your old place, and feel how everyone had got used to the bathroom, the squeaky kitchen door, the carpet in the living room, the way you could bounce a ball against the wall down stairs..
1. 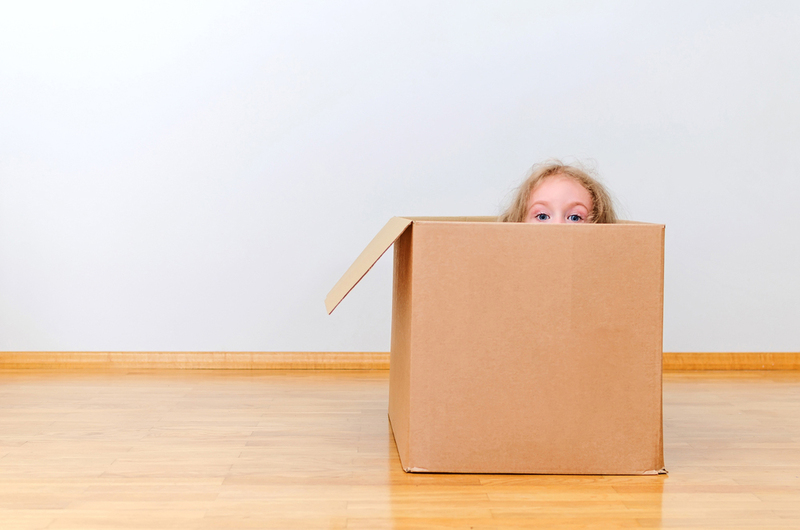 Play hide and seek in your new house – or hunt the thimble, hide the toy in your apartment. 2. Play the “maze “ game…as in a maze, close your eyes and trail a finger around the walls of a room. One person guiding. 3. Make a quiz about your home, or the neighbourhood. How many rooms have shutters? Which room has the most tiles? Who in the street has a cat, how many front gardens have atree? What colour is the house/apartment next door front door? SHOULD CHILDREN’S THINGS BE UNPACKED VERY EARLY ON? WHAT IF STUFF HASN’T ARRIVED? Then you can plan where they can go. Buy storage boxes, or shelves perhaps? If there’s no carpet – make chalk marks on the floor, or lay out string to mark the furniture spots. SHOULD WE BE KEEPING A POSITIVE ATTITUDE ALL THE TIME? WHAT ABOUT IF THE CHILDREN GET A LITTLE SAD OR MOPY? It’s very important to allow the kids to say what’s good and what’s not so good. Sometimes they will pick on one thing they haven’t got any more as a symbol of all they left behind. especially about friends or pets that are part of the old community. It’s a mix of reminiscing about the old, mourning it a bit and welcoming the new in a positive way. Have a look at local resources to see what’s on… where’s the cinema, is there a local museum that will introduce everyone to the town, find maps of the area and pin them on the wall. Get informed – if you feel better so will the children!